We already know that farmers and farm workers who use conventional methods of planting are exposed to egregious amounts of pesticides, herbicides, and fungicides. They suffer from all kinds of serious health problems due to this contact with multiple poisons. The worst part? There is no eliminating pesticides from our foods once it is sprayed onto our plants, but as if that weren’t enough, now companies like Monsanto are ‘breeding pesticides’ right into our food crops with genetically modified organisms (GMO). In a study of children who didn’t live anywhere close to a farm that were given organic foods for two weeks, they had incredibly lower levels of pesticides in their urine samples during those two weeks. As soon as they were given conventionally grown foods again – those contaminated with pesticides – the levels of poison in their urine spiked again. These pesticides can’t be washed off. The irony of this is that pesticides were used in the first place to try to increase crop yields and protect crops from insect damage; however, a report issued by the Union of Concerned Scientists entitled Failure to Yield: Evaluating the Performance of Genetically Engineered Crops states very clearly that any increases in yield for either GMO or organically grown crops were due to improvements in agricultural practices and not GMO seed. The studies which outline the pesticide exposure endured by the farming industry are so prevalent we couldn’t list them all in one place, but a Cornell University study mentions the numerous ways that workers are exposed to pesticides, from dirt-dust on tractors to water contamination to chemical spraying, and just some of the outcomes of this exposure – including cancer. 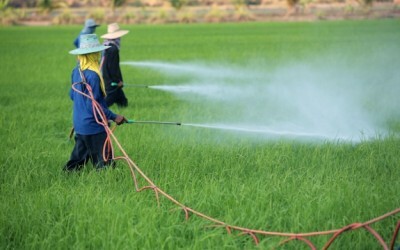 In another study, children exposed to organophosphate pesticides (OPs) have higher chances of developing health problems including impaired motor-coordination and cognitive functioning as well as respiratory disease along with a host of other issues. Even infants can be exposed to high levels of OPs if they live on a farm, through consuming their mother’s breast milk. If farm workers are blatantly poisoned by their exposure to pesticides in our conventionally grown food supply, why is it not a logical conclusion to assume that we will suffer from similar issues even if we live in a more urban setting? While biotechnology has been promising better crop yields since the early 1990s, they have yet to deliver and in the meantime our children are peeing out their poisons in lab tests. Exposure levels are continuing to affect not just farmers and their families, but also the public at large. Instead of 800,000,000 pounds of pesticides, might we not look to organic practices that actually do increase crop yields and save our future generations? Organic farming practices are accumulating some steam. In fact, the number of organic farms nationwide has grown to well over 8,000. These farms have sufficiently dispelled the perception that organic farming is too difficult, too risky, or too expensive to be practical. Improving soil fertility, utilizing well timed interactions of crop rotation, intercropping combinations, planting schedules and maintaining beneficial habitats are just some of the ways we can ditch our pesticide habit as a nation, and make ditching GMO crops a forgone conclusion. Fluoride pesticides inundate our farm lands. Plants absorb it through their roots and directly from newly applied poisons. Hence, we are being over-fluoridated by hundreds of times the government's own guidelines. No known filtration system can remove much fluoride from water, because the fluorine molecule is approximately the same size as the water molecule. Even distillation only gets about 20% of it out. Agricultural run-off and discharges from water treatment plants and rain sewers perpetually poison our rivers which perpetually poison the oceans. Fluoride is the "acid" that, in fifty years, killed America's coral reefs that took thousands of years to form. Cuba has pristine reefs, because they either couldn't afford to or chose not to poison their people and land. Email al.smith at majorityvoice*com for your free copy of "The Fluoride Nightmare," a concise yet comprehensive, five minute speech to educate your city council on the horrors of water fluoridation which will become known as one of the banksters' worst crimes against Humanity.